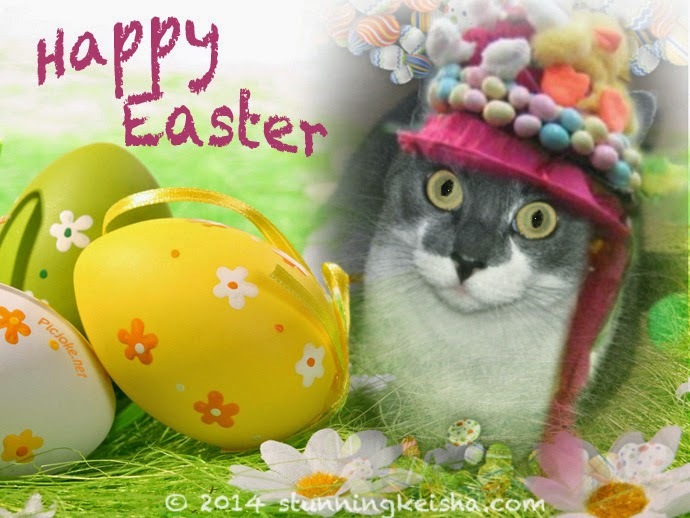 Yep, I’m hopping down the kitty trail in another ugly Easter bonnet. This was my first bonnet ever. There’s not going to be another 4-lb chocolate Easter bunny in the condo this year. Mr. BunBun is only 2 1/2 lbs. It’s the end of an era. Considering the peeps are still working on the Valentine’s Day heart, that’s probably a good thing. How is your family celebrating the holiday? Are you getting an Easter basket? Wishing you a Blessed Easter from my condo to your house. And a very Happy Easter to you too! Happy Easter! I heard some talk about crab cakes eggs benedict for breakfast - hope that means some crab for me! My human's boyfriend always gets her a basket full of the fancy dark chocolates and truffles that she likes. Then she tries to get us cats to pose in the basket, usually with limited success. And a very blessed Easter to you, TW and Pops too! The boys and I are going to hide away from people, watch some Bogey movies, make some pawsome pastry treats, and *not* thunk about problems for just 1 day, paws crossed! Happy Happy Easter to you tooo ! Happy Easter to you CK and all your family and we hope you have a lovely day. Sounds like you are not fond of the bonnet but...you look super cute! You look devine CK! Happy Easter Hoppy Hugs from all of us. That's still an impressive chocolate bunny, CK! The head peep is going to spend today helping friends move (who moves on Easter? They do, apparently!) so we are going to dump over the basket of all of the balls she found in the whole house and have a whapping pawty. Happy Easter to you and your peeps, CK! My Sibes did a Easter kibble hunt! They had fun! Happy Easter!!!! (and BTW, the secret sibe society is just for fun you silly stunning kitty!) hehehehehe!!!!! You would look pawsome in a set of husky ears!! Have a great weekend! Much Love! No baskets here but mom did see the Easter bunny! No baskets here, CK. We're hoping the peeps will just let us loll about in the sunpuddles. And maybe give us some extra treats, too. Happy Easter to you, TW and Pop! No chocolate bunnies around here. Happy Easter to our furriends and their humans. No baskets around here. Except full of laundry. Great photos CK!!!! Happy Happy Easter! CK, at least you're not wearing stoopid bunny ears. Happy Easter. Happy Easter CK. I was left home alone while M and D went to their daughter's and then to Milwaukee to be with son-in-low's family. Sigh! I will get extra kibble in payment tonight tho - or they'll hear about it. Love that Easter picture you did. Happy Easter! Sadly there was no chocolate in our house this year (mom is working on her diabetes and blood sugar levels) but there is hope for next year! We are glad the Easter bunny was good to you! Happy Easter! We had an egg hunt today - so much fun! Hope you enjoyed your Easter, CK! Hi CK.....well, let's say that hat of yours is - well - colorful!! 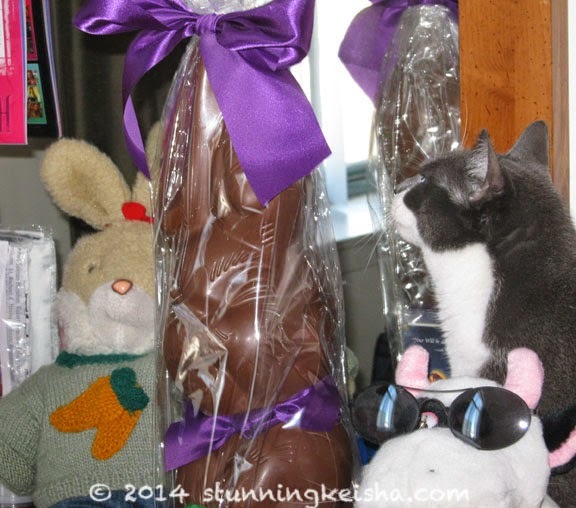 Yep the Bunny came to my house this year and I posted some pix of me sniffing the goodies on my blog today. I know you hate the bonnet, but you really do look adorable in it. We started downtown for a very big Art Festival and we couldn't find a parking space within walking distance, so we ended up at the pub watching the Rays game. It looks like you all had a fun day, so go ahead - have another one! Hello my darling! Aw, no more 4-pounders? Shoot! But since you asked, I *did* get a toy for Easter but honestly it's really just a big disappointment. It's a wand toy the Human thought I would LOVE but you know what? I don't. I'll prolly give it another chance, but so far? Ho hum. A belated Happy Easter. Mom has been saving all our pics to an external hard drive so we can download Windows 7 - taking a longer time than she thought. TW and Pops are amazing...we've never known ANY humans that can make chocolate last as long as they can!